Jocey Designs believes a successful site attracts visitors with interesting, truthful and useful content. It must also create a positive visual impact and function reliably. 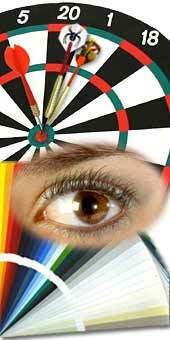 Clearly identify the target audience and the objectives of the Web site. Design the Web site to be productive, functional and most importantly, user centered. The layout should be clean, clear and easy to read with different browsers and on all platforms [Mac, PC/DOS, UNIX, Linux], regardless of the operating system. Recognize the typography limitations of the Web. The navigational interface should be consistent, intuitive and logical. To ensure quick viewing, graphics should be prepared properly and optimized as much as possible without losing their visual quality. To safeguard appearance, and avoid dithering of images, all colours used on a Web site, whether in graphics or in HyperText Markup Language (HTML), should be chosen from the Web safe colour palette. Too much colour can be "noisy", counterproductive and distracting. It is wise to use colour with restraint and to respect the power of white space. A Web site should render nicely and be easily accessible to the majority of Internet surfers, regardless of the computer they are using or their browser settings. A good Web site should download fairly quickly regardless of the type of Internet connection or modem used by the visitor. The total weight of the page should be kept in check. Points to keep in mind: Not everyone has a cable or DSL connection, some still use a dial-up modem. As a rule of thumb, the average connection will need one second to download 7K of data... and visitors usually don't wait more than 10 or 15 seconds for a page to load before they move on to another page. Search engine optimization should be constantly taken into consideration within the coding and design of a Web site. Page and link titles, Meta and ALT tags should be formulated and used appropriately to increase rankings with Internet Search Engines. Relevant keyowrds should be identified and applied to improve indexing by search engine spiders and bots. Web site registration with Internet Search engines and directories should be done on a regular basis. The Web site is not launched until the client is satisfied. Sustained branding, marketing and promotion efforts must be applied in the real world to support online identity. How can you boost your web site's credibility? Read Stanford University's Guidelines for Web Credibility.